As your trusted Arlington chiropractor, we want to answer to some of the most commonly asked questions we receive ABC Family Chiropractic and Wellness. If you still have questions about chiropractic care, please give a call at (781) 648-8500 and we’ll make sure you get the answers you’ve been looking for. We accept most insurance plans and will verify your coverage and work with you for a suitable care plan that addresses your problem. Your care plan will be based on your health needs and not necessarily what your insurance covers. As a Arlington chiropractor, I have been a preferred provider for BlueCross/BlueShield for many years. At ABC Family Chiropractic & Wellness we are also providers for Tufts, Harvard Pilgrim, Medicare, Harvard Vanguard, Neighborhood Health Plan and many others. We will verify your insurance coverage on your first visit. Most plans have a deductible and then have you pay a co-pay. For those individuals without chiropractic coverage, we offer affordable care plans. Once I start chiropractic care, do I have to come forever? How long you continue your Chiropractic care is always up to you. Dr. Mark Potter will make up your care plan with three goals in mind. First goal with each patient is to get you some relief! Once some of the pain and inflammation is reduced and Relief Phase is complete our patients usually continue their care with Correction Care. The purpose of Correction Care is to make sure the chances of your original problem returning is minimal. Finally, Strengthen Phase is to allow the correction to be stabilized. Many of our patients decide to continue having their spine and nervous system checked ongoing for Wellness Care. We live our lives through our Nervous System. It makes sense to stay well adjusted! How long is a visit with a chiropractor? Your first visit to ABC Family Chiropractic & Wellness will be approximately 45 – 60 minutes. Dr. Mark Potter will meet with you a conduct a thorough consultation and examination. Ongoing visits are usually 10 – 15 minutes. Do you give adjustments on the first visit? Most patients are evaluated on their first visit and once appropriate diagnostic tests have been performed an adjustment is usually administered on the second visit. If your health problem warrants x-rays you will be referred for an x-ray. Is ABC Family Chiropractic accepting new patients? Yes! Call our office today. If you are hurting or thinking about trying chiropractic to improve your health, we reserve time each day for new patients. Don’t delay. It is time to get your power turned on. New patients are always welcome. We encourage family members to get their spine and nervous system checked. 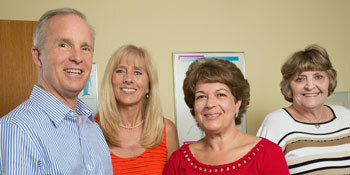 The purpose of the first visit to Dr. Mark Potter is to find out if we can help you through chiropractic care. Contact ABC Family Chiropractic and Wellness today to schedule an appointment! (781) 648-8500.